Last weekend, we invited Little Girl’s classmates over for a Tangled theme party. Ah, Internet. How I love thee. I have only to throw a few words into the search engine to get hundreds of ideas. The links below have the full instructions and patterns. 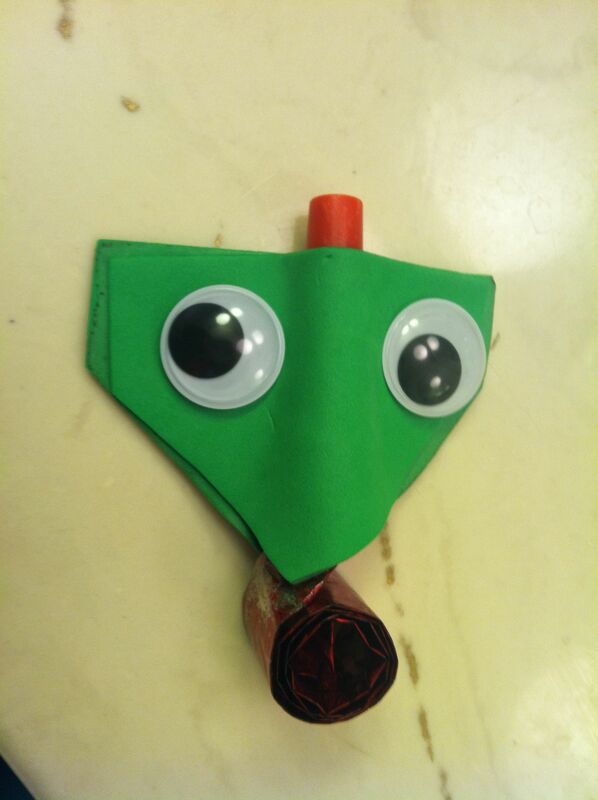 To make Pascal party blowers, you need green adhesive foam and the pattern; googly eyes, glue dots, and party blowers. (I wrote them a letter, saying they should put the label on the back where it won’t matter, and the rep wrote back saying she’d passed on that info. 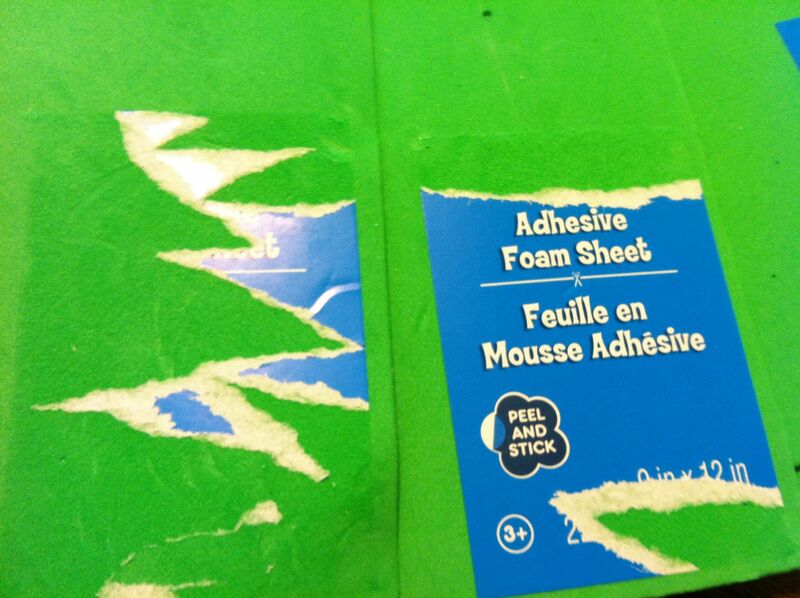 No, I did not get a coupon for a free sheet of foam or anything. Hummph). Anyway, keep that in mind: you might not be able to use that section at all. Next, lay the pattern down. Be sure when you do the other side, you flip the pattern over. The sticky backs will be together like this, to make Pascal’s profile. Don’t peel them until you stick the blower inside. Some kids (like mine) put the eyes on top of the head. Also, DO NOT USE NOISE BLOWERS. We did. It was a little bit loud. 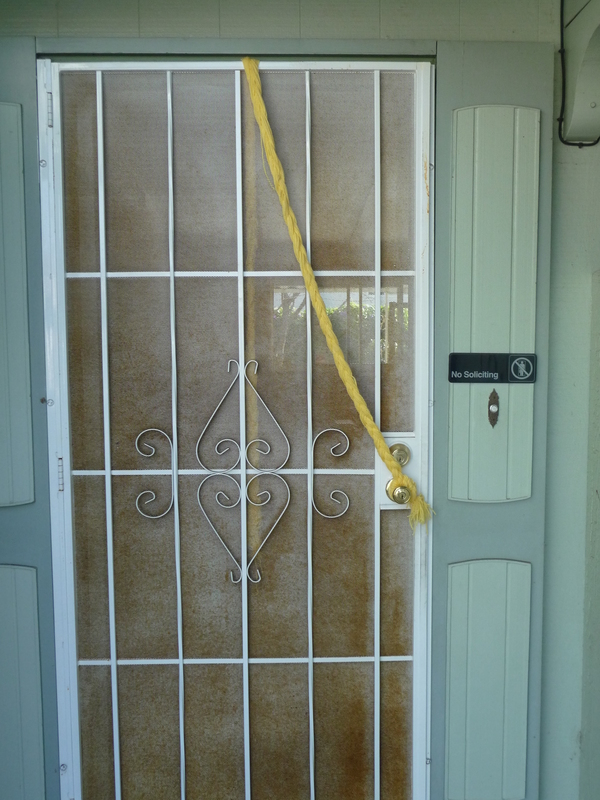 We made a Rapunzel braid to hang over the door. Instructions are hyperlinked at the bottom. This didn’t take as long as I thought it would. Each section of braid uses 12 yarn pieces, approximately 20 feet long each. Just get a big cheap skein someplace. You may need two people to do it. I started braiding with Eldest, but it got confusing quickly, so I put a book on one end as a weight and did it alone. 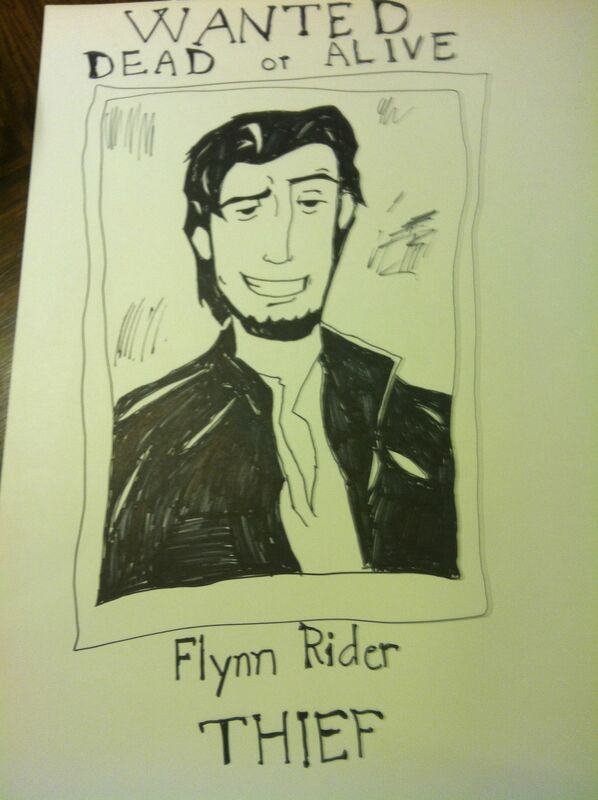 Eldest freehand drew the Flynn Rider poster. 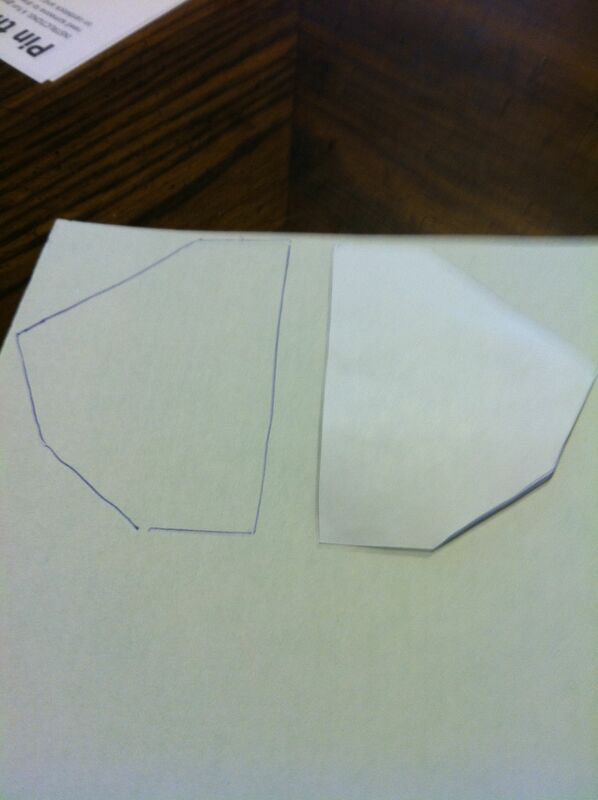 I was most impressed, especially when she asked if I wanted her to make a grid over both to precisely copy it. I told her it was up to her and she chose freehand because it was quicker. I lettered the writing. 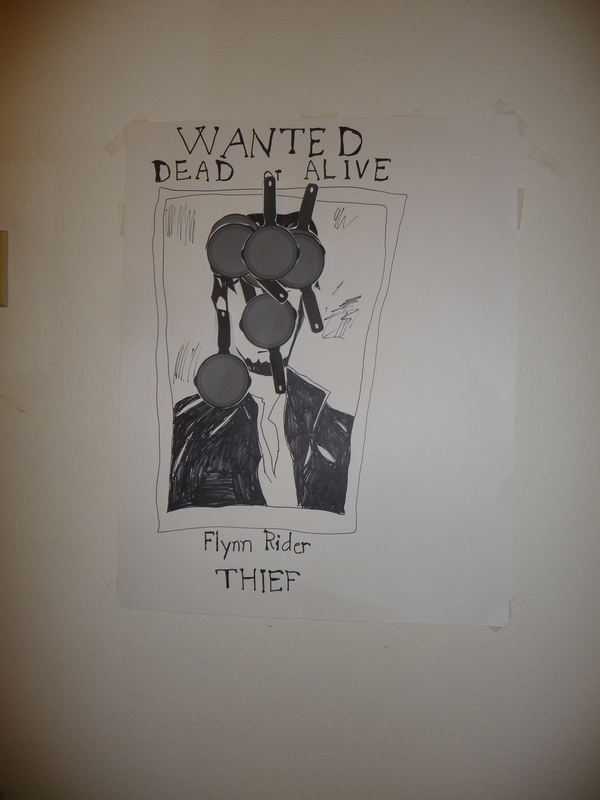 It was “Pin the Frying Pan on Flynn Rider” and it was a success. Guesstimate how tall your tower will be, and saw the dowel to the right size. 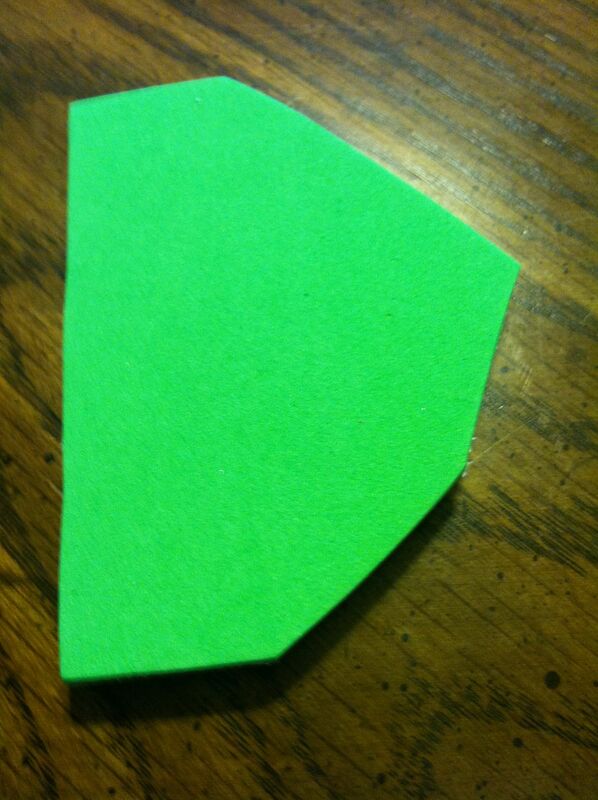 Stick the dowel into the base (mine was a piece of green foam, covered with scrapbook paper I happened to have). Stick on the rolls, alternating which way they face. Put an upside down cupcake on top of the rolls. Top that with a rightside up cupcake. Place the waffle cone on the very top. Cover it with purple frosting. I got a tube of green frosting, no piping implement on the end, so my vines are rather rudimentary. The kids were really impressed by the cake. They wanted to tear into it, but I told them they were pecan rolls, so they lost interest. Finally, the FIRE part. We had the party in the late afternoon (with pizza dinner) so it would be a little dark for this. 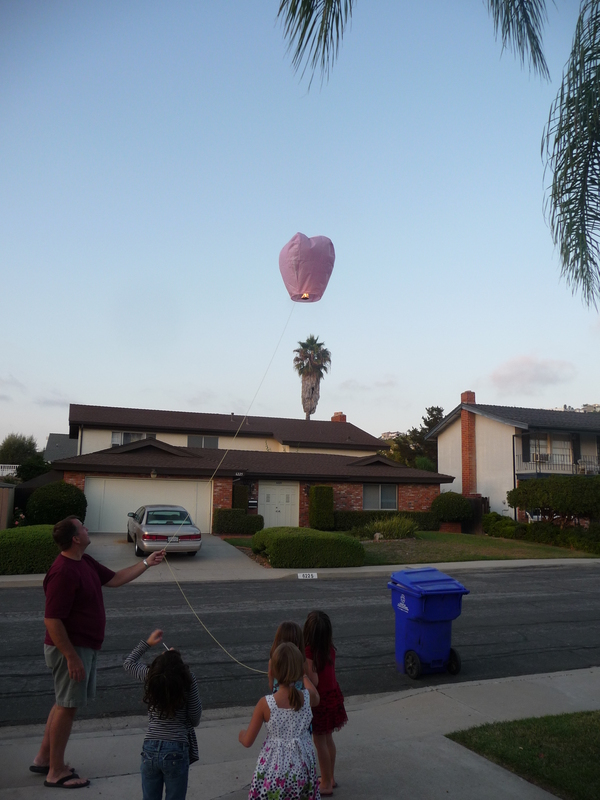 Originally, Cadillac wanted to let each girl do her own lantern, so we got eight from an online supplier. He thought we’d go to the park and do it. 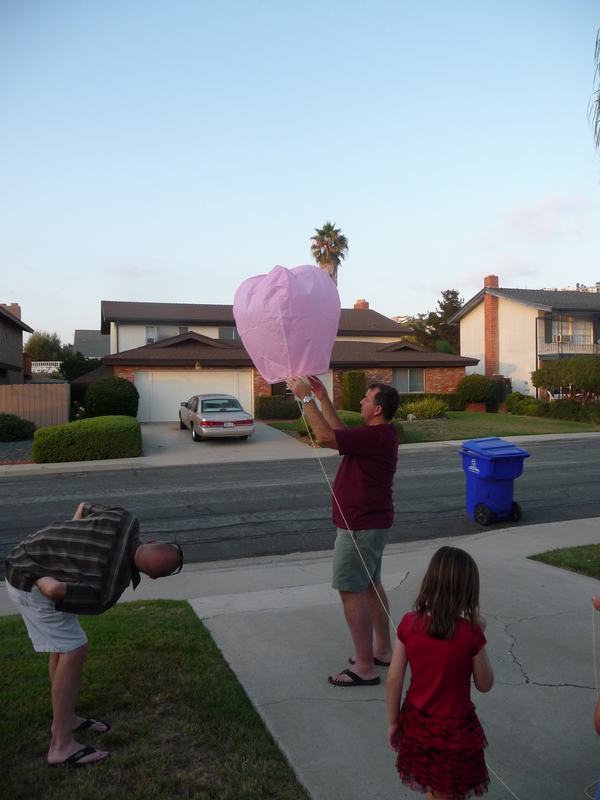 But it turned out to be a windy day, and we live in California where there are fires, and the fire department is within spitting distance of us, so it was better to do it in the driveway (me speaking) near the hose (which I had on standby). 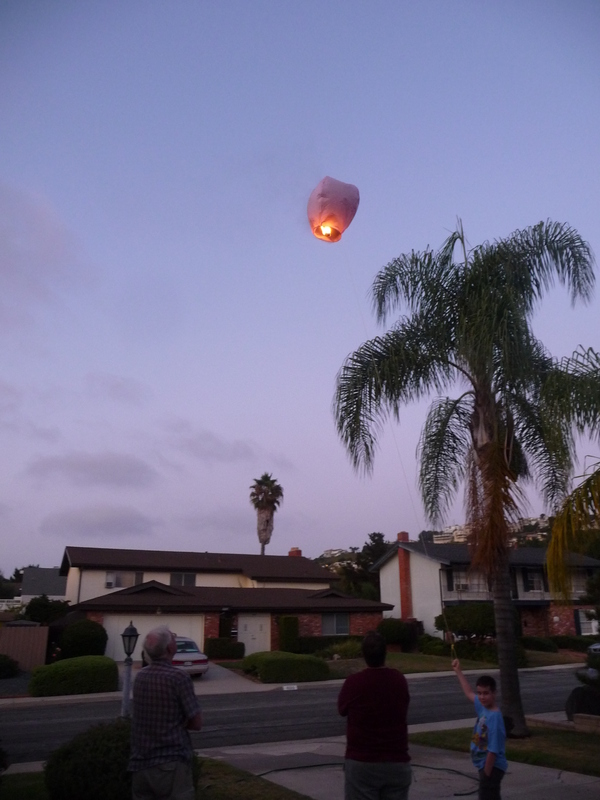 Each lantern took more than a minute to light and fill with hot air, so we ended up just doing a few. We told the girls to make wishes on them, and if they did, they didn’t say them aloud. 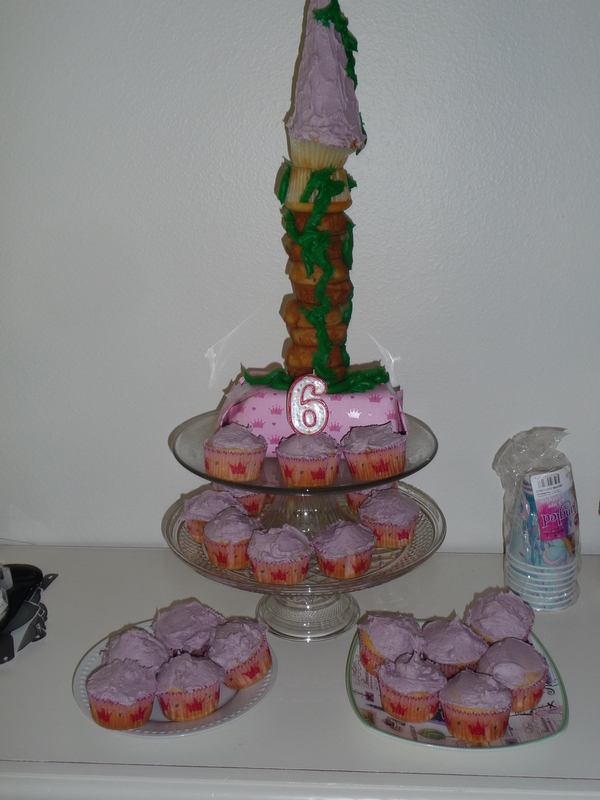 Another blog I used for the cake. Crafty Texas Girls. Pascal party blowers, Flynn Rider game. Super Mom Moments. So cute! You are quite creative. And I love the freehand drawing of Flynn!